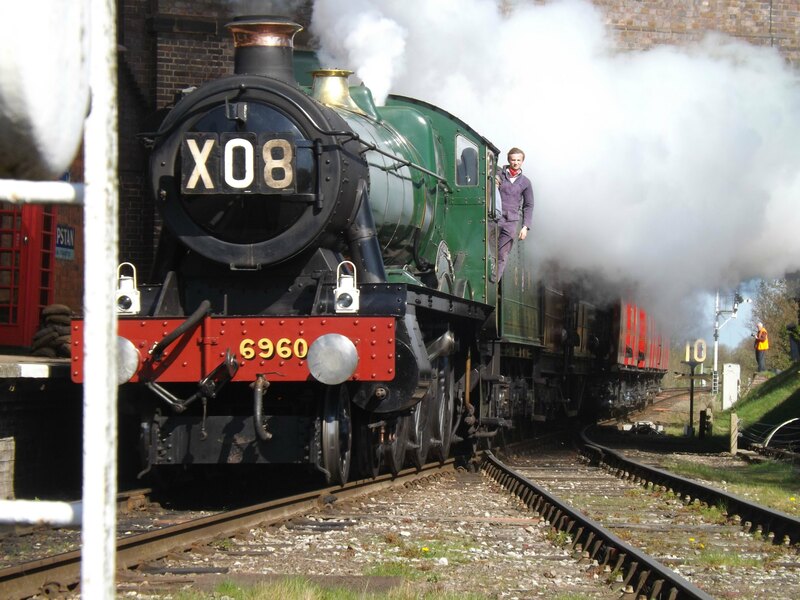 … we’ve had a good few years to visit lots of places where steam locomotives can be seen. Such places include museums and historical, working railways and associated events. We also dash to Newark, Lincoln or Grantham stations when particular engines are passing through. It’s amazing how many steam fanatics do the same thing. These events are always packed. Steam locomotives were first developed in Britain in the early 19th century. Their use transformed the world, carrying people and goods at hitherto unthinkable speeds around the globe, and dominating railway transport until the middle of the 20th century, when they were replaced by diesel and electric locomotives. The creation of steam locomotives began with the development of the steam engine. 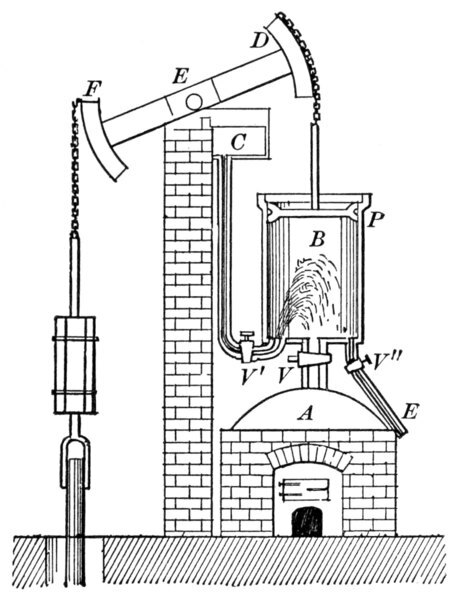 In 1698, Thomas Savery patented a machine that used steam to pump water out of the mines. His design was later improved by Thomas Newcomen in 1712 and further still by James Watt in 1763. It was Watt’s improvements to the steam engine that led the way to the steam locomotive. Newcomen Steam Engine. Author: Newton henry Black, Harvey Nathaniel Davis. Public Domain. Wikimedia Commons. 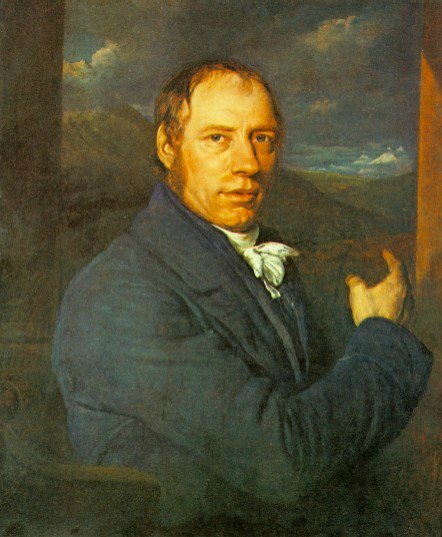 The first steam locomotive was made by Richard Trevithick in 1804. It was called the Puffing Eagle. Trevithick was a tall, strong Cornishman, described by his schoolmaster as ‘obstinate and inattentive’, who learnt his craft in the Cornish tin mines. He later moved to South America before dying penniless at the age of 62. But his idea was developed by others, and by 1845, 2,440 miles of railway were open – used by 30 million passengers in Britain alone. 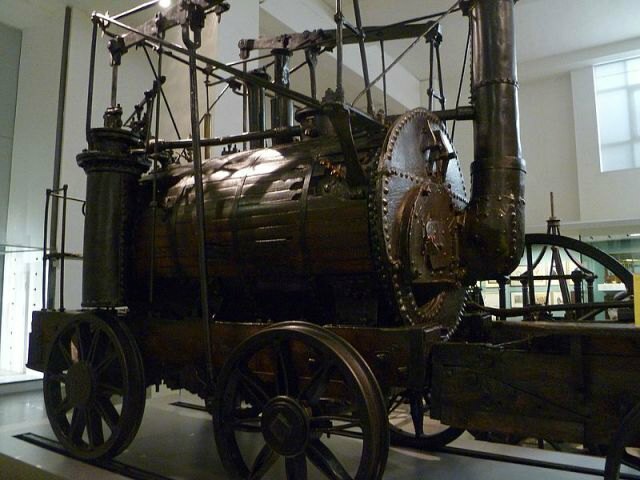 Another well-known early locomotive was the Puffing Billy built by engineer William Hedley in 1813-14 and is the oldest one preserved, and on display in the Science Museum in London. Puffing Billy (the oldest surviving steam locomotive in the UK). Location : Science Museum, London. Author: Arkady Rose. Creative Commons. George Stephenson built the Locomotion for the Stockton and Darlington Railway in north-east England, the first public steam railway in the world. In 1829 he built The Rocket, which won the Rainhill Trials and established his company as the foremost builder of steam engines used on railways in the UK, US, and much of Europe. 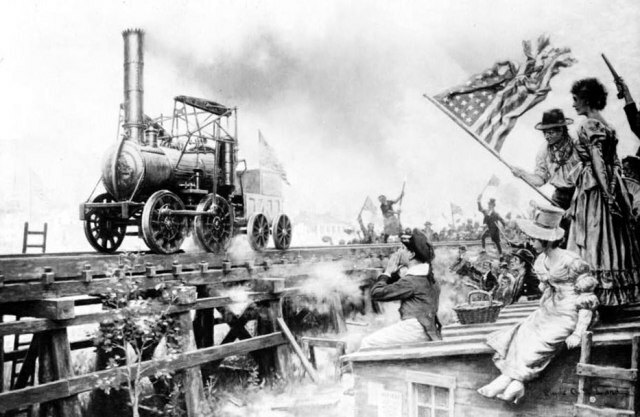 The first steam locomotive to run in the U.S. was shipped from Britain and called the Stourbridge Lion. It was ordered for transporting coal but, at 7.5 tons, it was too heavy for the tracks which were intended to hold 4 tons. Another locomotive imported from Britain was the John Bull. 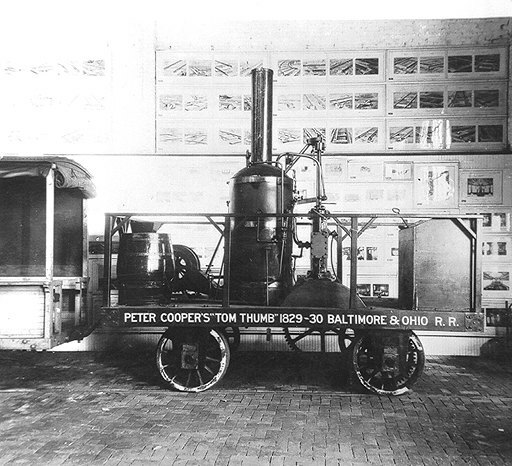 The first steam locomotive built in America was the Tom Thumb, which had its first run in 1830 on the Baltimore and Ohio railroads. It carried 36 passengers and travelled at 18mph. The first railway service in Continental Europe was opened in May, 1835, in Belgium, between Mechelenand and Brussels. The locomotive was The Elephant. 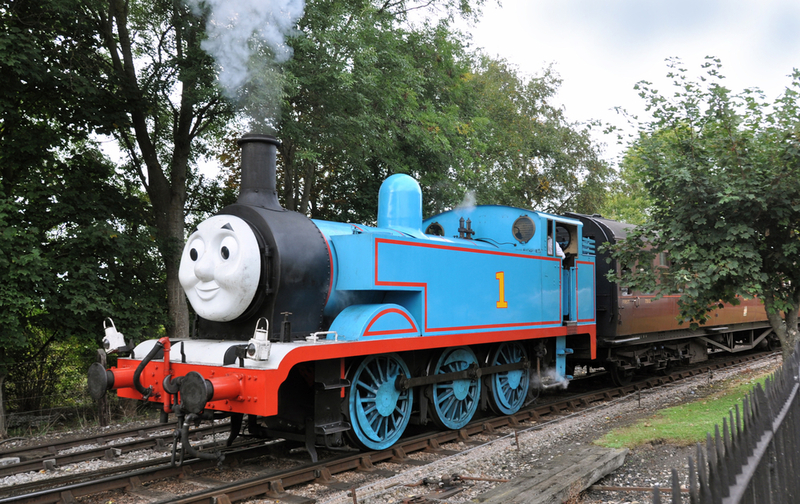 Today, most steam locomotives still in use are for historical, educational or entertainment purposes. Railway museums have many interesting exhibits, and I have a post to do sometime on the National Railway Museum in York, which I visited (yet again!) two weeks ago with Kieran and other family members. 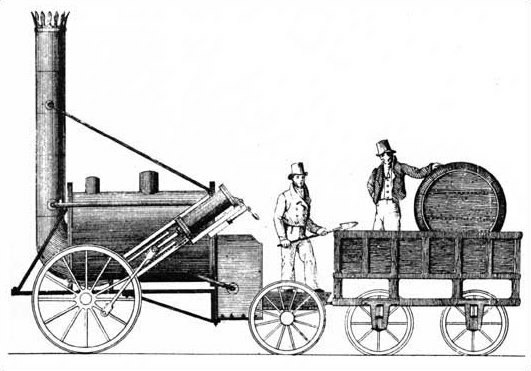 We’ve come a long way since Trevithick launched his first practical steam locomotive in 1804. 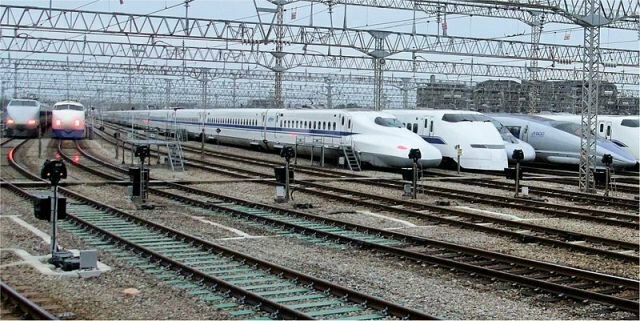 Today, several high-speed trains are regularly travelling 30 times faster. Japan’s first bullet trains in 1964 were capable of running at speeds more than 130mph. The world record speed today is 361mph! But Japan is no longer alone in the high-speed rail department. France, China and Germany all operate trains capable of similar extreme speeds. Plans are also underway to construct a high-speed rail line connecting the Californian cities of San Francisco and Anaheim. What an interesting history to watch unfold! I love the pictures and had no idea how many changes and interesting steam locomotives were made! Very lovely Millie! I also love the first picture so much! Thank you, Lynz. The first photo was taken by my grandson. He’s a great photographer, as well as a history lover and train geek! We live, eat and breathe steam engines when he’s around. Wow, 361 miles per hour! That is fast and far faster than the first one that ran at 18 mph! This is so interesting Millie! Great pictures of locomotives too. Thanks for taking the time to do this. My info. this week was far to long to add at the end of my story, PJ, and I enoyed doing it. Those speeds are just mind-blowing, I agree! They sure are! And 18 mph is laughable! though. It would probably seem quite life threatening, then! Haha. Yes, I know what you mean. Hahaha! Can’t believe how “modern” trains are now a days! We have old steam trains still running just for fun once or twice a year. There is also a train museum near me.. I can’t believe the speeds of those bullet trains – although people say you can’t tell you’re going that fast when you’re on one. It’s all a bit mind boggling. We have a lot of steam engines running on heritage railways in various parts of the country. I love travelling on those. Makes me also thinking back to my first years when teaching. I used the train every weekend. I also went on holiday and slept over on the way in a train with steam engine. We also used to take the children on outings for a day using steam trains! Similar thing here. I travelled to school on a steam train every day from the age of 11 to 18. I love the sound of the wheels. It’s almost hypnotic. Oooo, love it. Very special that one had this opportunity to travel in a train like that as every day of transport! We didn’t think of them as anything paricularly special at the time. They were just what was available for getting about. Now I look back and think how amazing they were. Yes, I agree. It is the same with old buses too. Did you know that in Malta until just a few years ago, the only service buses were ones built during wartime which they’d bought from Britain. One we went on was in such a state, I could see through weak spots below my feet, down to the road. Those buses would be great in a museum but not in everyday use. They eventually got rid of them and now have ‘bendy’ buses, which are far too long for most of the roads, so everyone is complaining about them. We have a transport museum in Lincoln and there are lovely old buses in there. More happy memories, Ineke. Oh wow. Chicken coop seems to describe that bus well! What an amazing memory for you. Modern buses are quite luxurious to what we had back then. Thanks for sharing this Millie. I travelled to school by steam train, we used to have to make sure the windows were shut as we pulled out of the station on certain days as the smoke and soot would come in and settle on our school uniforms. It certainly was even the train arriving and covering us with smoke as it chugged in to pick us up. Very interesting post, Millie. I’ve never been on a high speed train. But whenever I see a steam locomotive on tv, my heart rejoices in sweet memories. Not unrecognised in Cornwall – the name Trevithick is a well-known! I suppose Trevithick’s name is also known to anyone interested in history, or just steam engines. It’s one of those names most school kids (outside of Cornwall) forget, in favour of Robert Stephenson and his ‘Rocket’. To me, Trevithick was the original ‘great’. My husband (a chemist – yes, hold the crossed fingers uo now) has always spouted about Trevithick. Nick’s totally into industrial developments, so we all just follow along… making lots of detours along the way! Locomotives do look so inspiring. I saw a documentary a while ago, hosted by David Suchet, where they traveled the Orient Express route in an old-fashioned style train. It was decorated inside like it would have been in the old days. Fascinating. The steam makes for great photos, too. I completely get you! I think I am too, though maybe on a slightly lesser scale (I also love airplanes and cars – especially old ones, for both). I’d love to travel that route too – and that documentary was so good with the “real” monsieur Poirot, though in the documentary he appeared as himself – charming. You know, instead of Argentina, hubby and I were planning on traveling to China by train via Siberia? Unfortunately it just turned out too difficult to arrange with our timetables, budgets, visas, the winter arriving, etc. So we went to Argentina instead! But the Siberian train route to China is still an item on our list! Your posts about Argentina were when I first ‘met’ you! I loved your photos! I still want to go to Argentina, after reading your posts. As for China… that Siberian route sounds awesome. I just wish I was at least 20 years younger to do all the things I’d like to do … :). You’re still young 🙂 It’s good that we ended up going to Argentina, in many ways. I don’t know if Siberia would have inspired me to start a travel blog! Oh, I fancy Siberia, too! I’m a geography teacher, so I want to see as much of the world as I can. Perhaps I shouldn’t have had six children, then I could have started earlier! Seriuosly though, we both fancy going to Argentina.Your posts really inspired me. I’m so happy to hear that I’ve inspired you to go to Argentina! Let me know if you need tips (more precise ones). Hello again. I doubt that Argentina will be on the agenda for next year. 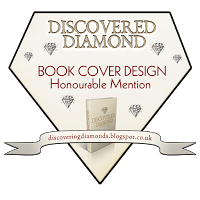 We already have a few things lined up fot then, and only after I finish this book! The year after is looking likely, though. little edit: “especially old ones”, it’s supposed to say! I have never heard of Trevithic, and so sad for him to die penniless when his idea changed the world. Perhaps he should have taken out a patent? Yes, it is sad that Trevithick was never recognised for his achievements. Others took his design and improved it, and got lots of acclaim.I suppose at the time, people didn’t recognise the potential of Trevithick’s engine. I hope it turned out Millie. The smell is delicious!!! You are such a busy person and blogger so its great you did the honour of using my recipe , or Sophie’s at least. It’s turned out really well. :) I’ve been very naughty and cut into it already (when it was warm!). It was lovely! I’ll tell you about it when I come onto your blog. I know a 3.5 year old who is so over Thomas you would not believe. Oh yes, as a matter of fact, you would. These days he’s totally fixated on steam trains. That and Lego , of course. Steam trains do seem to bring out the romantic side of so many of us. It’s strange, when you think how unpleasant it could be in a carriage with all the smoke billowing back. Thank you for this informative and somewhat nostalgic blog. The sight of the railway tracks always brings back memories. Recently we took our little girls for an hour long train trip, and they loved it. I love travelling by train, Inese. It’s so relaxing, compared to driving. And steam trains a just in a league of their own. I’m sure your little girls thought it was a great adventure. I was surprised myself why such a secrecy. It is a Scottish company, I guess the same you are talking about, and you are right, it is unlikely they would do it every year. Still, a great trip, go for it. One night won’t be so expensive. No, it’s very ‘doable’. I love that part of Scotland, too. The Highlands and Islands are wonderful. Woo! You have got a lot of information which I was missing and searching for!! Glad that I found you here! Thank you, Piyush.Im happy to have found yiour blog, too. The first picture is lovely. Trains tell a tale of a time which now seems distant and nostalgic. I remember, as a child, when.we had our summer vacations we would board one of the steam engines to reach at our aunt’s place. We only had a few electric engines in 90’s (I guess, early 90’s) depending on the route – small towns or big cities. I loved the steam ones and my mom hated them. And very soon they were replaced. I remember asking my mom, “where is the other one,” and she said they don’t make those ones now. I was a bit sad and still asked – why?